BEIRUT (AP) — Iran takes part in international talks on Syria for the first time this week, giving it a voice in the effort to find a resolution to the more than 4-year-old civil war that has so far defied even the slightest progress toward peace. A crucial backer of Syrian President Bashar Assad, Tehran has been shunned from all previous talks on Syria. Its inclusion now marks recognition by the United States that no discussion on Syria’s future can succeed without Iran at the table. News of Iran’s attendance outraged Syrian rebels, who said its participation will only prolong the conflict. The gathering Thursday and Friday in Vienna will also put Iran in the same room with its most bitter regional rival, Saudi Arabia, raising the potential for tensions. The kingdom, along with other Gulf countries, has been funneling weapons to rebel factions, while Iran has sent financing, weapons and military advisers to ensure Assad’s survival. Iran’s participation reflects its newfound place in the international community following the nuclear deal reached with world powers earlier this year. It also shows the seismic shift brought about by Russia’s direct military involvement in Syria since launching a campaign of airstrikes on behalf of Assad last month. That intervention has emboldened Assad’s supporters. Russia’s intervention — and its insistence that it seeks a political solution — have created a new dynamic. While no one expects a breakthrough, the Vienna talks are the most serious attempt yet to put an end to a conflict that has killed a quarter of a million people and displaced millions of others, touching off a humanitarian crisis of spectacular proportions and unleashing Islamic extremists across the Middle East. The core power players at the talks are Russia and Iran, the two top supporters of Assad, and the U.S., Saudi Arabia and Turkey, the top backers of the opposition. Those countries, with the exception of Iran, attended a first round of talks in Vienna last week. Who’s not there? Assad’s government and the Syrian opposition. That reflects the intent of the gathering. It’s not a negotiation between combatants; it’s an attempt by the outside powers with a hand in the conflict to reach common ground on a solution. If the track eventually leads to progress, the parties would then have to persuade — or, more likely, strong-arm — their allies in Syria to go along. The conference has also been widened from last week’s round to include countries from around the region and Europe. The expansion from a huddle of the key players to an international conference appears aimed at ensuring that all those who could influence the conflict are roped into backing any results. Among those invited are Jordan, Qatar and the United Arab Emirates, all backers of the rebels, as well as the Iranian-allied Iraqi government and Lebanon, home to the Shiite Hezbollah guerrilla force that has also sent fighters to shore up Assad. At the heart of the Vienna talks — and the most contentious issue — is the future of Assad. Participants are trying to resuscitate the 2012 Geneva Communique which called for the formation of a transitional government in Syria that would oversee free and fair elections as part of a broader political transition. Yet in the 40 months since the communique was signed by Russia, the U.S. and other nations — though not Iran — there has been no movement toward implementing it, mainly because talks have always hit a wall when it comes to what role, if any, Assad should have in the transition. Inviting Iran to the talks, especially if no agreement is reached, could create a backlash. Al-Jubeir, the Saudi foreign minister, said if the talks fail, “we will resort to other options.” He did not elaborate, but his words suggest the kingdom would step up military aid to the rebels. The opposition is eager to see that happen. “Every assistance to Assad must be met with assistance to the opposition,” said Bebars al-Talawy, a Homs-based activist. Rebels and activists in Syria denounced Iran’s inclusion. Ahmed Ramadan, a member of the Western-backed opposition-in-exile, the Syrian National Coalition, said inviting Iran ensures the meeting will be a failure and lead to an escalation in fighting. Another problem is the opposition’s lack of unity. The Syrian National Council touts itself as the representative of the opposition, but it has no authority over the dozens of rebel factions battling on the ground, who range from nominally secular nationalists to hard-line Islamic militants. While many have formed alliances, they answer to different commanders and have different international patrons. The one thing they have in common: They all hate Iran and Russia and are likely to reject any solution that strengthens their hand in Syria or doesn’t clearly lead to Assad’s departure. It’s unlikely that a concrete deal on Syria will come out of the talks any time soon — or even a vague, common vision for the future. The Obama administration has said repeatedly that all the countries must agree on a unified, secular and pluralistic Syria governed with the consent of its people. But even if all sides say that’s their goal, that doesn’t mean they agree on what it means or how to bring it about. If the U.S. and its allies contend that vision cannot be reached with Assad in power, Iran and Russia can counter that a fragmented rebellion dominated by Sunni Islamic hard-liners will hardly achieve it either. It’s hard to conceive who could bring about such unity and pluralism, with hatreds stoked among Syria’s Sunnis, Alawites, Shiites and other sects by nearly five years of mutual slaughter. At best, the conference might bring a re-commitment to the 2012 Geneva Communique, this time with Iran signed onto it, and perhaps an agreement to begin talks on implementing the transition it calls for, according to U.N. diplomats who spoke on condition of anonymity to discuss the delicate issue ahead of the talks. But that would hardly be an advance over 2012. Syria’s civil war has defied every international effort toward a political settlement. Various international conferences and U.N. observer missions failed to make a difference, and two of the U.N.’s most seasoned diplomats quit in frustration. The Vienna track could similarly crumble. 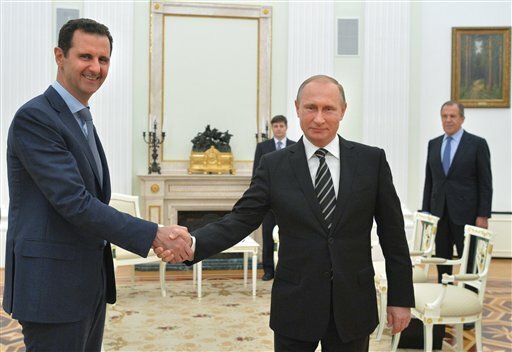 Any optimism now is based on speculation that Russia is not wedded to keeping Assad in power and that including Iran could be a game-changer. The biggest accomplishment from the talks may be in building some degree of trust among the powers that have turned Syria’s civil war into a proxy conflict. The only reason either side in the war has survived this long is because of outside backing. In Vienna, each side will likely sound out the other for possible confidence-building measures or wiggle-room in their positions that could lead to common ground. Associated Press writers Edith M. Lederer at the United Nations and Sarah El Deeb in Beirut contributed to this report. Tags: Beirut, Iran, Syria. Bookmark the permalink.